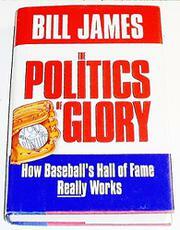  Baseball maven James (The Bill James Historical Baseball Abstract, 1986) offers a witty, contentious examination of the Hall of Fame, covering its history and politics with typically incisive and outspoken commentary on who is in the Hall and who should be. The Baseball Hall of Fame was devised during the Depression as a way to attract visitors to the upstate New York village of Cooperstown. Since then, it has become both the most revered sports shrine of its kind and a lightning rod for controversy among baseball fans. As James illustrates by generously quoting from heated letters to sports periodicals, seemingly everyone has a favorite player who they think has been unjustly denied a home in the Hall. Some of the acrimony grows out of the chaotic evolution of the Hall's admissions procedure over the last 60 years, a process that James delineates in detail with his customary scathing wit. In addition, James offers analyses of those enshrined and those omitted, to bring some order to this anarchy and so that readers can get a sense of the criteria involved and how they affect the players whose names will be considered in the future. At the center of the book is the controversy over former Yankee shortstop Phil Rizzuto, whose omission from the Hall of Fame has sparked long-lasting and bitter campaigns and counter-campaigns. Ultimately, after examining the Rizzuto candidacy from a profusion of viewpoints statistical and historical, James concludes that the ``Scooter'' doesn't really belong in the Hall, a position that is certain to engender more shouting from all sides. James also addresses other Hall-related controversies, including the election of Dodger pitcher Don Drysdale and the barring of Pete Rose. Another home run from baseball's most interesting iconoclast, guaranteed to fuel the kind of good-natured arguments that make baseball our most intellectually provocative sport.